Last night in Amsterdam the 2016 European Fintech Awards celebrated innovators shaping the future of finance. A total of nine awards were presented to companies selected by a panel of judges for the quality of their pitch. A total of 29 Finovate and FinDEVr alums were recognized in the European Fintech Top 100 list. Companies awarded on this list were selected by a combination of online public votes (weighted 25%) and a panel of judges (weighted 75%). Digital Insight to provide Touch ID functionality in mobile banking apps. Coinbase unveils its bitcoin exchange and wallet service in the U.K. The Currency Cloud appoints former Deutsche Bank CIO, Mitchel Lenson, to non-executive director. Green Dot Bank chooses MasterCard as its transaction processor and network gateway. Columbia Bank picks Fiserv DNA for its account-processing platform. The Finanser interviews CEO and co-founder of Ripple Labs, Chris Larsen. AMP Credit Tech launches Amplifi Capital to directly finance unsecured loans to under-served small businesses in the U.K.
Expensify debuts new automatic statement-reporting feature. ComputerWorld: SocietyOne makes case for peer-to-peer lending. Sonavation launches its IDKEY biometric security key that uses 3D Surface Scan Ultrasound technology. CMSWire interviews Michael Laurie, co-founder and VO of product strategy at Silanis Technology. iExpats takes a look at Azimo in a column on the costs of foreign currency transfers. Holvi plans expansion to Germany and Austria. Arxan Technologies Security Solutions architect Matt Clemens talks mobile app security on Federal News Radio. PaymentsSource’s look at “strange mobile security methods” features EyeVerify and Bionym. IntelliResponse wins bronze at 9th annual Stevie Awards for Sales & Customer Service. Jack Henry & Associates to be honored at Cedar Falls Business & Industry Association event. Now Digital Network reviews Kashoo in column on ways to streamline small business accounting. Computing U.K. features TransferWise and its use of big data to drive its social media marketing. The CoinFront reports on Klarna’s “experiments” with bitcoin. AMP Credit Technologies wins “Highly Commended Award for Best Initiative in Financial Inclusion” at the 6th Retail Banker International Asia Trailblazer Awards in Singapore. TIO Networks now has 1+ million registered members in its direct-to-consumer user base. Taulia names Cedric Bru as new CEO. Advanced Merchant Payments (AMP), a company that provides banks technology to offer loans to their small business customers, pulled in an undisclosed amount of funding today from Route 66 Ventures. The new installment is a follow-on round to the $5 million Series A round received in November 2014 from SBT Venture Capital. Kabbage Expands to Australia in New, White-Label Collaboration with Kikka Capital. Advanced Merchant Payments Pulls in Undisclosed Amount of Funding. Ayasdi Raises $55 Million in Series C Funding. Yodlee joins FinTech Sandbox as data partner. Acculynk unveils new mobile wallet authentication service for issuers and providers. TSYS CIO Ken Tye announces retirement. Innosect (formerly Innovation Café) acquires Clientific. 5+ Community FIs to launch Apple Watch offering powered by Malauzai. Come see its live demo at FinovateSpring in San Jose May 12-13. CardFlight Announces Availability of EMV-Ready Chip Card Readers for SwipeSimple Mobile Point-of-Sale Solution. Rajesh Bhat, Co-founder at Roostify, shares what he learned from Yodlee Interactive Incubator Boot Camp 1. Google Cloud Platform introduces Google Cloud Launcher, where you can launch open source packages configured by Bitnami or Google Click to Deploy. HelloWallet launches Emergency Savings Calculator. Orchard Platform and Kabbage Announce Partnership to Provide Investors’ Access to Karrot Consumer Loans. PayStand mobile iOS app now available to allow credit card, check and Bitcoin payments. Alt-Credit Score Startup, Aire, Raises $1.1 Million. Polish & Slavic Federal Credit Union chooses online banking platform from ACI Worldwide. Finextra’s Future Money Focus interviews Thomas DeLuca, CEO of Advanced Merchant Payments. BBC column on Technology of Business features Azimo, Currency Cloud, CurrencyFair, and TransferWise in a discussion on the currency transfer business. PYMNTS features ThreatMetrix’s latest whitepaper. Shentel integrates InComm’s CashTie API to facilitate bill pay at retail locations. Financial Planning features FutureAdvisor’s freemium model. Expensify launches new policy editor design. Forbes features OnDeck Capital as one of three lesser-known strategies to secure business financing. Bluefin Payment Systems to power payment processing for Clubworx software platform. Cloud Lending Solutions announces agreement with BDO Solutions to bring its non-bank online lending platform to East Africa. Yesterday, as we began looking forward to FinovateEurope, we heard news from a 2014 alum, Advanced Merchant Payments (AMP). AMP, a company that provides banks with alternative lending options for small-and-medium (SMB) businesses, pulled in a fresh $5 million this week. 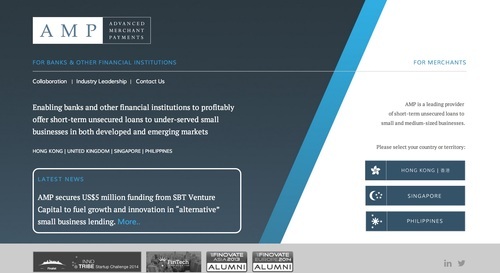 The funding, a first for the Hong Kong-based company, comes from SBT Venture Capital. AMP operates in Hong Kong, Singapore, and the Philippines, and has recently expanded into the UK, participating in London’s Level39 fintech accelerator. It plans to use the funding to further internationalize and scale the business. AMP debuted its small business lending solution for banks at FinovateEurope 2014. With more than 280 companies applying, and 47 companies selected to compete, the Innotribe Startup Challenge is down to the top 15 companies that will move on to the Grand Finale. And six of the companies to advance are Finovate alums. The Innotribe Startup Challenge is part of Sibos, the conference held by SWIFT each year. The goal of the Challenge is to help what the contest categorizes as “startups” and “innovators” get access and exposure to the broader fintech community. Events are held in London, Singapore, and New York during which competing companies pitch their innovations to industry experts and fintech investors. The Grand Finale will be held on October 1 at Sibos. The winning companies – one “early stage startup” and one “growth-stage innovator” – will receive a prize of $50,000 USD. The six Finovate alums among the finalists are below. For more information about the Innotribe’s Startup Challenge, visit their page here.